First: Make the Roux: Heat the bacon grease (or other cooking oil) on medium high. Add the tapioca starch and stir continuously for a LONG time. The longer you cook the roux, the deeper the color and flavor. I cooked my roux for 35 minutes. Mine was the color of an almond. You DON’T want to burn it. Add the onion, green bell pepper, celery, and garlic and cook for 5 minutes. Add the sausage, chicken broth, chicken breast, diced tomatoes, bay leaves, coconut aminos, paprika, thyme, oregano, salt, and pepper. Bring to a boil, then reduce heat to low and simmer for 45 minutes (you can simmer for up to 2 hours to enhance flavor!) *In a hurry? The soup is ready when the meat is fully cooked, about 10 minutes, but you want that delicious simmered flavor! Once the chicken is fully cooked, remove it from the gumbo and shred it. You can use the age-old fork shredding method OR throw it in a mixer with the whisk attachment – it will blow your mind! Add the shredded chicken back to the gumbo. Separately, cook the fresh okra in 1 T olive oil for 15 minutes. Remove the okra from the pan with a slotted spoon and add it to the soup mixture. (see notes). If you’d like to add the shrimp, add it in the final 10 minutes of the soup’s cooking time, and cook until it is light pink in color. As you probably know, okra can get a slimy texture to it. This is especially true if we were to just throw the okra into the soup. You can either follow the directions for cooking the okra on the stovetop OR you can cook it in your oven! Preheat the oven to 425. Toss the okra slices in 1 T olive oil and season with salt and pepper. Cook for 15-20 minutes. Remove from the oven, and use a slotted spoon to add the okra to your gumbo. 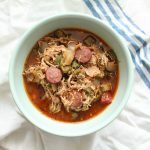 You CAN skip these steps and add the okra straight to the gumbo, but don’t say I didn’t warn you! This could lead to a gooey gumbo!